PakTech designs and manufactures post-consumer recycled packaging handles and automated handle applicators based in Eugene, Oregon. As an established yet innovative packaging leader in the beverage industry for over 25 years, PakTech delivers the highest quality and most sustainable turn-key packaging solutions. PakTech’s commitment to quality is paralleled by their commitment to the environment. They are dedicated to bringing the highest quality to the market, with the least environmental impact. PakTech handles are made with 100% Post-Consumer Recycled (PCR) resin and the handles are 100% recyclable. Their carriers are repurposed from recycled HDPE #2 milk jugs. The PCR production process uses 100% less petroleum, 90% less energy, and emits 78% less greenhouse gases in comparison to virgin plastic production. In 2018, an equivalent of more than 103 million plastic milk jugs were kept out of landfills, repurposed, and reclaimed as the resin that PakTech uses during the manufacturing process to create new packaging handles. 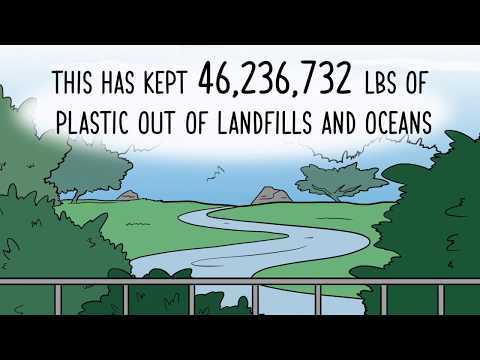 In total, they have diverted 235,674,794 milk jugs from entering the waste stream, kept 14,612 tons of plastic out of the landfills and ocean and saved 12.47 acre feet of land from being used as landfill for waste. PakTech handles make your wine cans easy to grab, carry, and remove. The carriers are attractive and feature a minimalistic design, highlighting your carefully created can artwork. While other packaging options wrap and surround your cans, PakTech carriers snap at the top so your brand won’t be covered or obscured. PakTech multi-pack handles offers improved consumer value and sales. Available in more than 30 standard colors and custom color match, PakTech offers enhanced product value with a wide array of eye-catching color options. Your product will pop on the shelf with our color coordinated accent carriers while keeping can tops clean for the consumer. PakTech handles keep can tops clean and ready to open and enjoy. 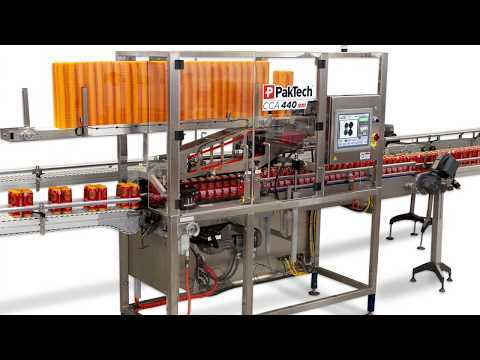 For flexible production requirements, PakTech also offers automated application versatility. You can apply the handles by hand if you’re a startup or have a limited volume requirement. Or you can utilize their automated applicators ranging in speed from 120 cans per minute to over 1500 cans per minute if you have a higher speed operation. PakTech’s packaging solution is turnkey, making them the smart choice for your new, smart canned wine venture. From design to final handle application PakTech’s responsiveness, rapid turn-around time, and comprehensive product offerings separates us from our competition. Tremendous value is what we offer and what we deliver, for our customers, our employees, and to the beverage and food industry. On-demand Can Carrier application optimized to meet customer’s required output rate. PakTech handles are repurposed from recycled HDPE #2 milk jugs and similar unpigmented containers. In 2018, an equivalent of more than 103 million plastic milk jugs were kept out of landfills, repurposed, and reclaimed as the resin that PakTech uses during the manufacturing process. In total, we have diverted 338,267,223 milk jugs from entering the waste stream, kept 20,973 tonnes of plastic out of the landfills and ocean and saved 17.90 acre feet of land from being used as landfill for waste. We believe post-consumer recycled plastic (PCR) is part of the solution by limiting the amount of new plastic. When our handles are recycled they often see a second life as composite lumber, flower pots, pipe, park benches and the like. Handles manufactured with post-consumer resin are the right product for our clients, for consumers, and for our planet as a whole. The PCR production process uses 100% less petroleum, 90% less energy, and emits 78% less greenhouse gases vs. virgin plastic production. PakTech continues to be committed to the environment and our communities. We all need to do whatever possible to keep plastics out of our oceans, parks, community and landfill and back into the recycling stream so they can be repurposed. As part of this commitment, we developed our own recycling program.